Exposure to pollutants in the air (like secondhand smoke) can directly affect health status and is linked to premature death, cancer, heart disease, and respiratory disease. 41.3% of children aged 3 to 11 were exposed to secondhand smoke in 2009-12. This objective has exceeded the target. Data Source: National Health and Nutrition Examination Survey (NHANES), CDC/NCHS. In 2009-11, the AQI exceeded 100 for 1.252 billion AQI-weighted people days. 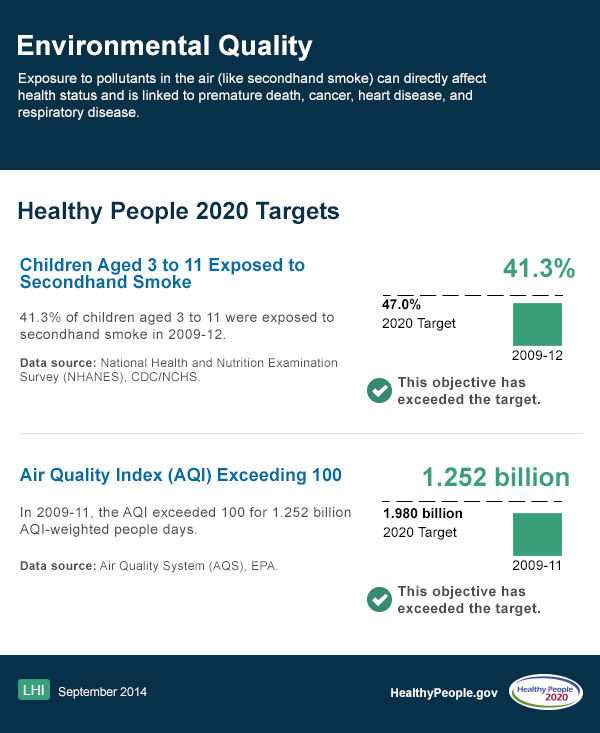 Data Source: Air Quality System (AQS), EPA.